All states allow for some type of exemption from vaccination, or re-vaccination. Vaccine exemptions generally fall into three types of exemption – medical, religious belief and personal/conscientious belief. In some states, there is also the possibility of exemption based on proof of immunity to a disease. Similar to vaccine requirements, your legal right to be exempt from vaccines is based on your state’s exemption laws and are often worded differently from state to state. When exercising your right to a vaccine exemption be advised that many states have provisions in their state law for unvaccinated children to be sent home from school during an outbreak of disease if that particular vaccine was declined. If you are having trouble with the map above, or want more specific information about your state, click here. Once there, you will be able to access your state’s vaccine policies and laws by clicking your state on the map or by locating your state in the text links below. Medical Exemptions: All 50 states allow medical exemption to vaccination. In most states, a medical exemption must be written by a medical doctor (M.D.) or doctor of osteopathy (D.O.). Some states also allow other state-designated health care workers to certify that the administration of one or more state-mandated vaccines would be detrimental to the health of an individual. Most states do not allow a doctor of chiropractic to write medical vaccine exemptions. Medical Exemptions Difficult to Get – A medical exemption to vaccination is very difficult to obtain because almost all medical reasons for delaying or withholding vaccines have been eliminated by government and medical trade officials. Most doctors and health care workers follow federal vaccine recommendations published by the Centers for Disease Control (CDC) outlining what is and is not considered a medical contraindication to vaccination. Some states will accept a doctor’s written medical vaccine exemption without question. Other states allow state public health officials to review and reject the medical exemption written by a medical doctor or other state designated health care worker, if health department officials don’t think the exemption is justified or because it does not conform to federal (CDC) vaccine contraindication guidelines. Religious Exemption: The constitutional right to have and exercise personal religious beliefs, whether you are of the Christian, Jewish, Muslim or other faith, can be defended. In the Old Testament of the Bible, Abraham is asked by God to sacrifice his son to demonstrate his faith. Although Abraham is willing, God does not force Abraham to sacrifice his son. In fact, God makes it clear that human sacrifice to demonstrate allegiance is not appropriate. Constitutionally, Americans have an expectation that their religious beliefs will be respected and that government will not pass laws that obstruct the exercise of this most fundamental of freedoms. If you exercise your right to religious exemption to vaccination, you must be prepared to defend it and explain your religious or spiritual beliefs in your own words. The religious exemption is intended for people who hold a sincere religious belief opposing vaccination to the extent that if the state forced vaccination, it would be an infringement on their constitutional right to exercise their religious beliefs. A state must have a “compelling State interest” before this right can be taken away. Limiting the spread of serious communicable diseases has been defined as a “compelling State interest” in court cases after the 1905 U.S. Supreme Court decision Jacobson v. Massachusetts affirmed the right of states to mandate smallpox vaccine. The exemption’s definition may be broadly defined to include philosophical, personal or conscientiously held beliefs not necessarily tied to an organized religion. Membership in an organized religion that has written tenets prohibiting invasive medical procedures such as vaccination. However, this kind of language has been ruled unconstitutional when it has been challenged in State Supreme Courts. A signed affidavit from your pastor or spiritual advisor from the church you attend. Notarization of your signature on a religious exemption statement attesting to your sincerely held religious beliefs about vaccination. If you belong to a church, consider educating the head of your local church about the sincerity of your personal religious beliefs regarding vaccination. You may be able to obtain a letter from your pastor, priest, rabbi or other spiritual counselor affirming the sincerity of your religious beliefs and file it along with any statement you may be required to write explaining your religious or spiritually held beliefs about vaccination. Philosophical, Conscientious or Personal Belief Exemption: This type of exemption is for individuals who hold conscientious objections to one or more vaccines. 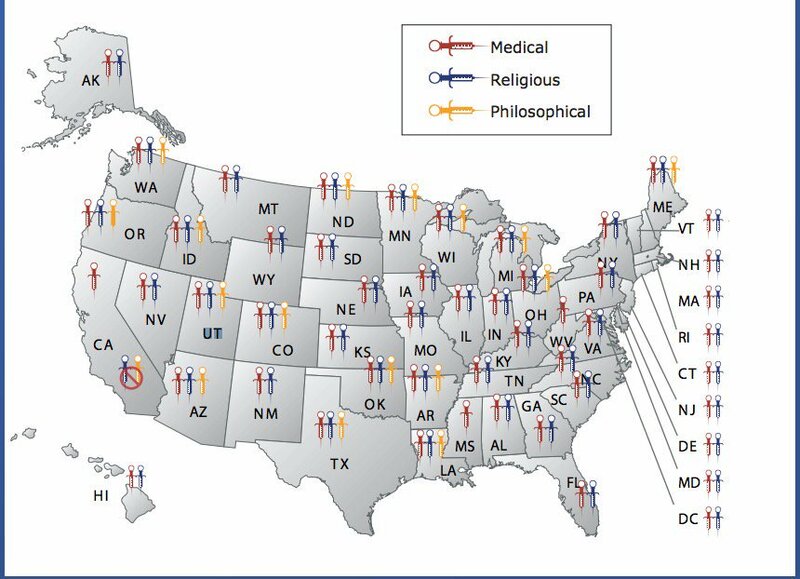 Less than half of U.S. states allow for an exemption to vaccination based on philosophical, personal or conscientiously held beliefs. Each state’s requirements for this exemption vary greatly from state to state. In some states parents or children old enough to give consent (usually age 12 or older) must object to all vaccines and not just one vaccine. While the term “conscientious objector” is generally associated with someone who refuses to serve in the military due to matters of conscience, according to the College of Physicians of Philidelphia it was The British Vaccination Act of 1898 that created a vaccine exemption based on conscientious objections that gave rise to this popular term. Proof of Immunity: Some state laws allow individuals to be exempted from vaccination or re-vaccination if proof of existing immunity for certain diseases can be shown. If a person has recovered from the natural disease or has been vaccinated, a blood titer test may indicate that there are enough naturally acquired or vaccine acquired antibodies to “prove” immunity to a particular disease. Private medical laboratories can perform the blood titer test and measure the level of antibodies and provide you with a report that you can submit with the request for an exemption if the antibody titers are high enough according to accepted standards. A blood titer test that measures antibody levels can cost $55 or more, depending on the disease. We hope this information is helpful to you and your family. Remember, you have rights. Know them.